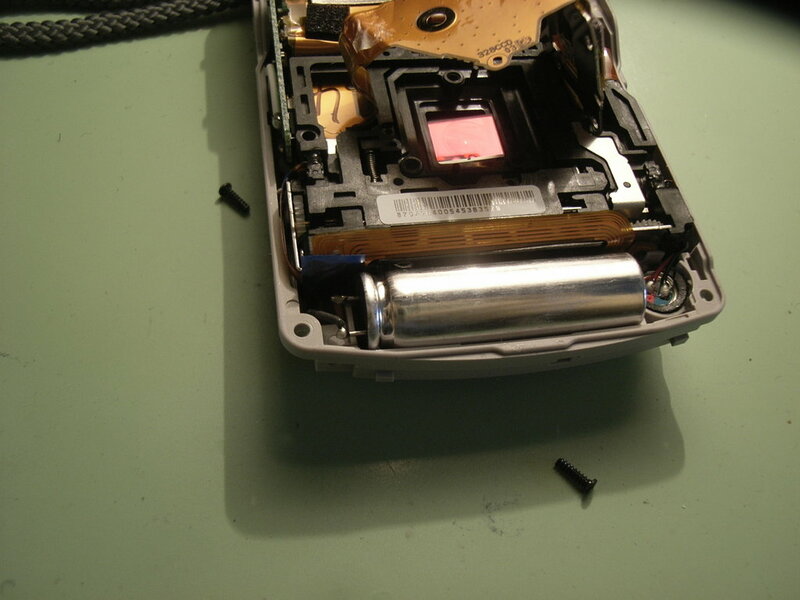 I opened the camera by removing the screws along its front cover. 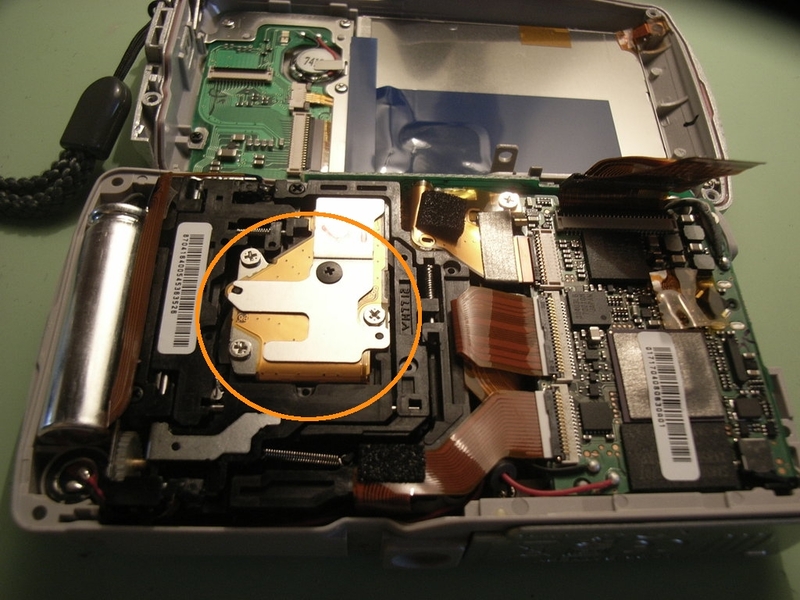 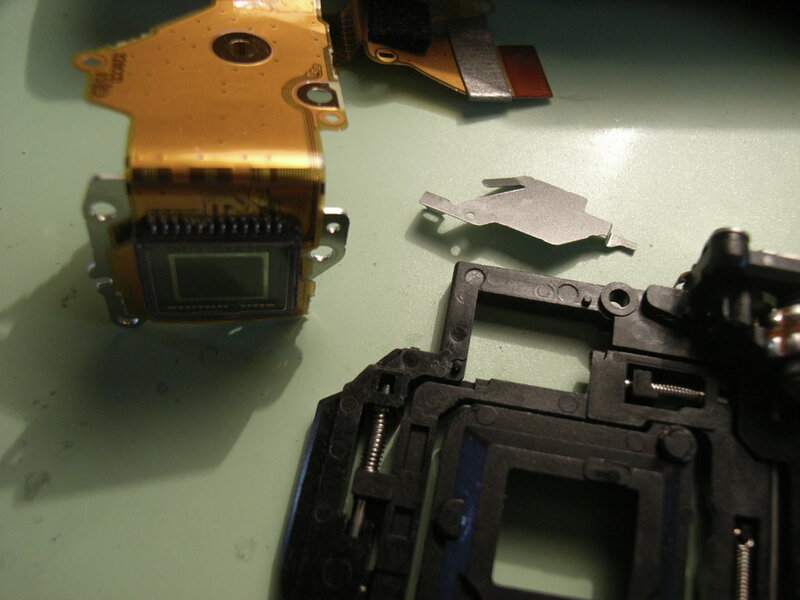 As the small screws are not identical, I suggest to mark their positions if you want to repair your own µ760! 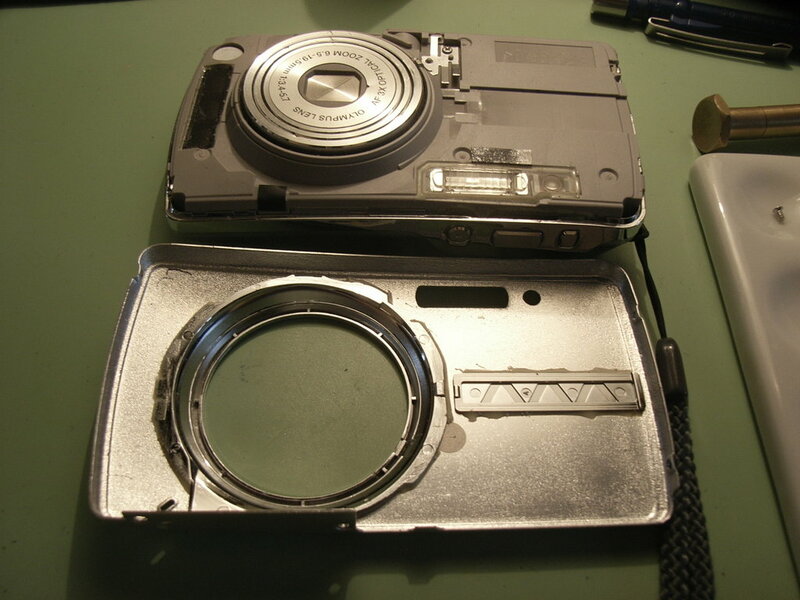 The picture above shows the grey inner plastic casing which is probably there for protection (the camera is marketed "wheatherproof"). 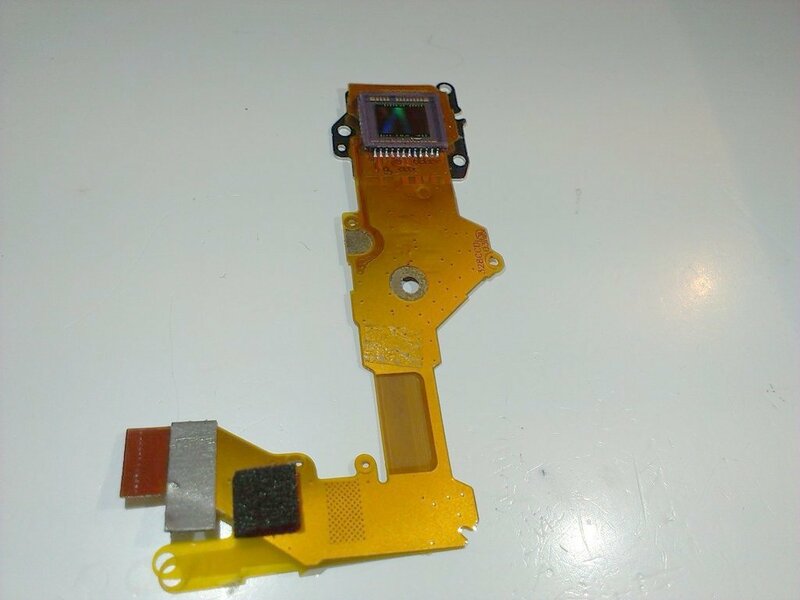 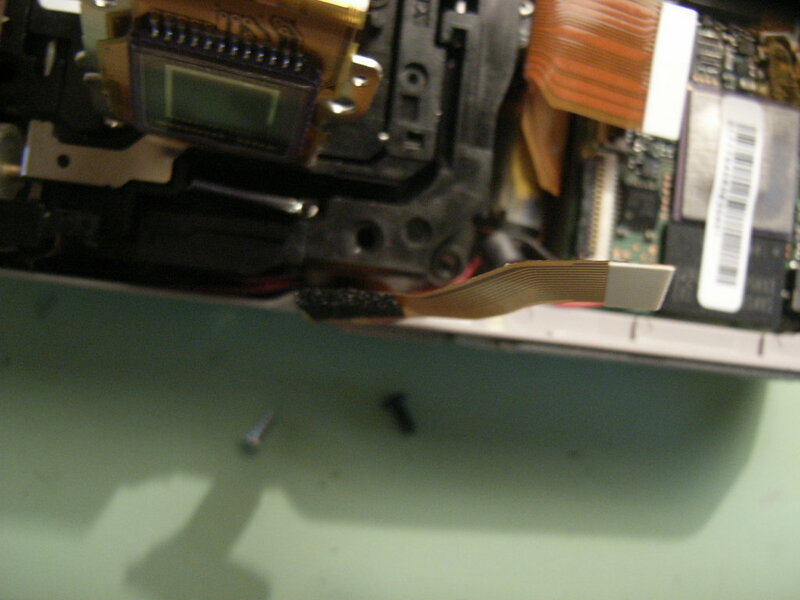 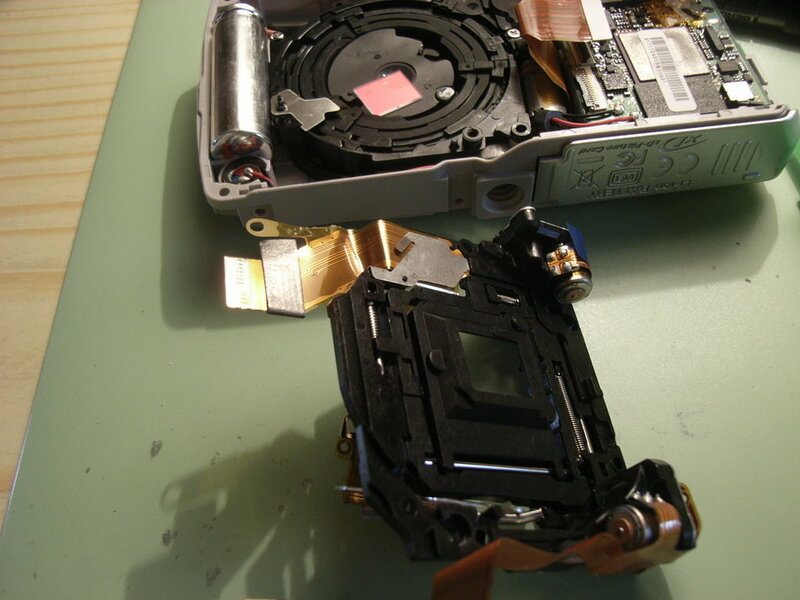 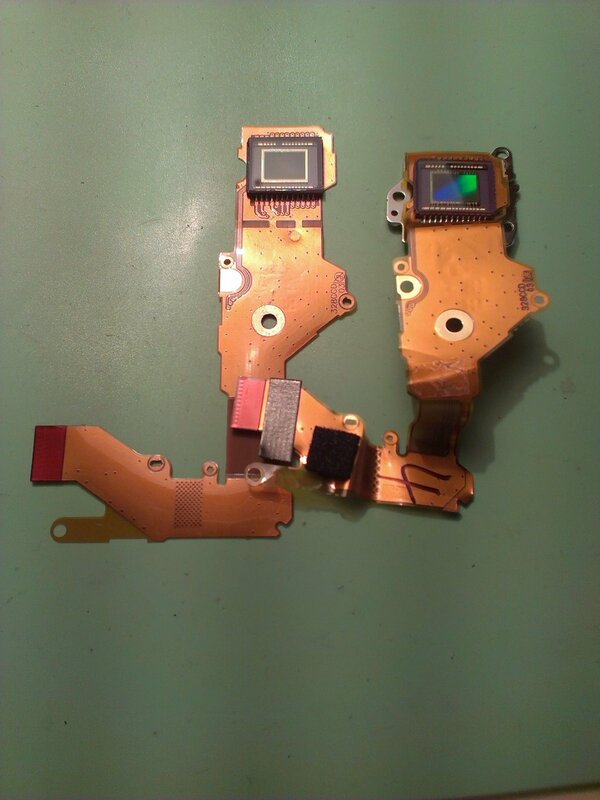 Next, I removed the four silver screws which held the grey cover in place and I opened the camera gently (be careful not do damage the flex cable linked with the buttons and screen of the camera´s backplane -> blue circle). 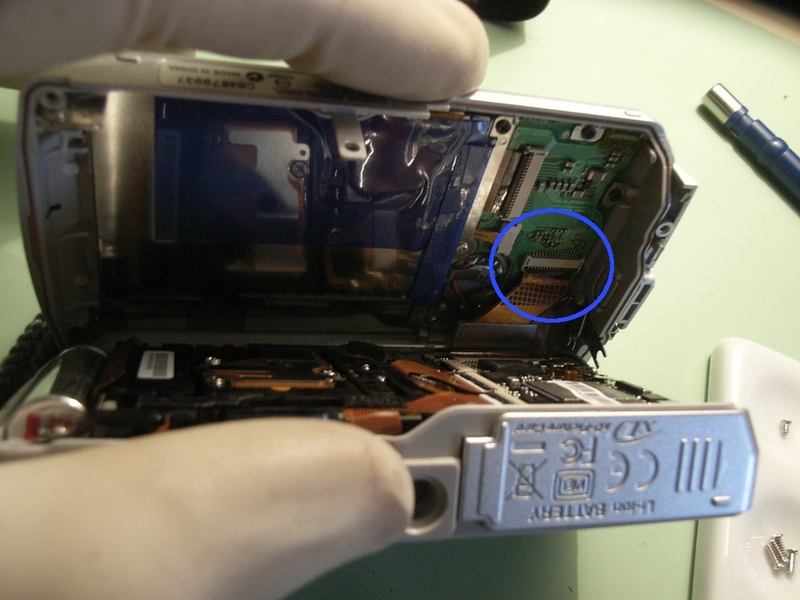 After opening the flex connector the two building groups could be separated without further problems. 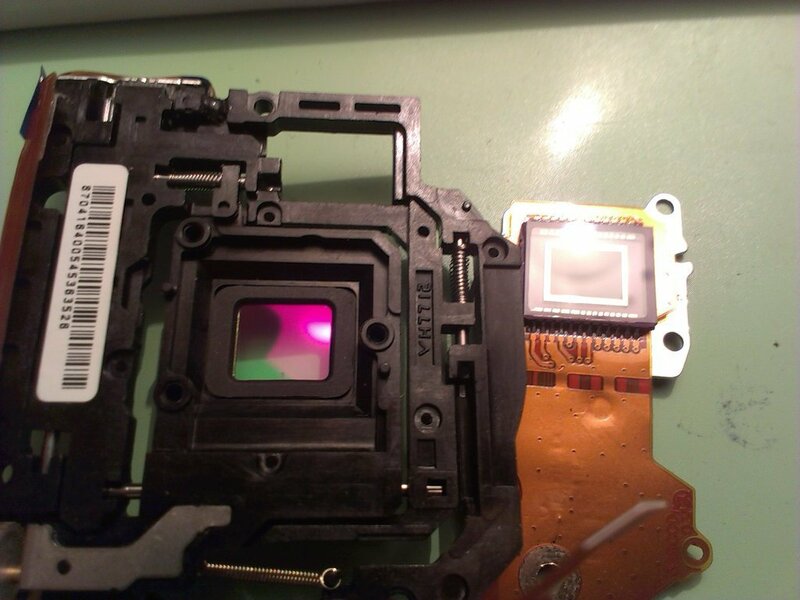 Next, I removed the rubber washer and the red-greenish infrared band elimination filter (IBEF) from the image sensor (the metal frame above the IBEF came off before, you can see it near the lens in the pic above). 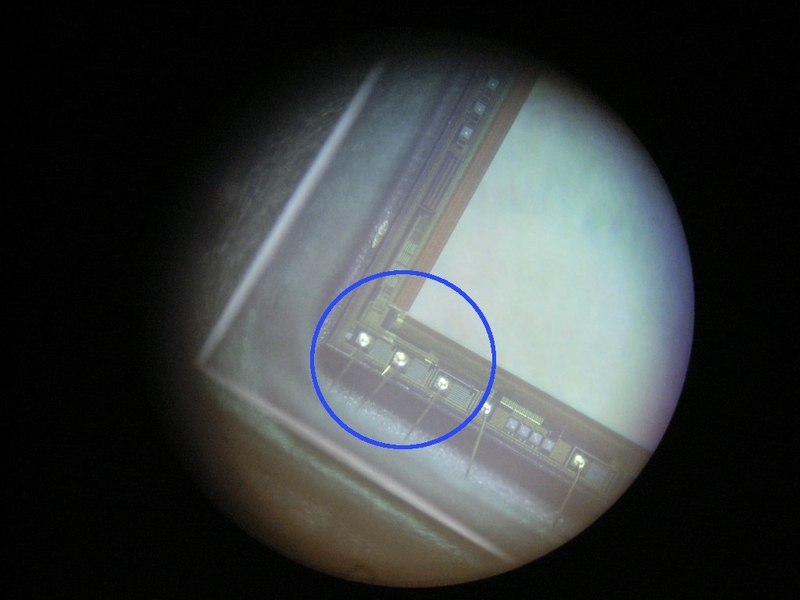 The examination under the microscope - I thought it might be reasonable to check the chip BEFORE I continued with further disassembly =-) - revealed what I exspected: A severed wire bond (blue circle, although barely visible). 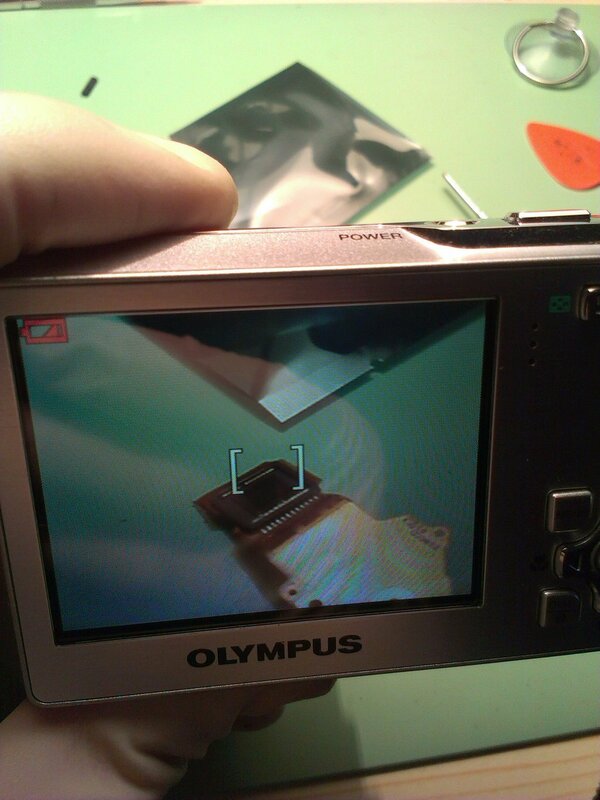 As the new image sensors has not yet arrived (delivery from an ebay seller from Hongkong...), this article has to stop at this point. 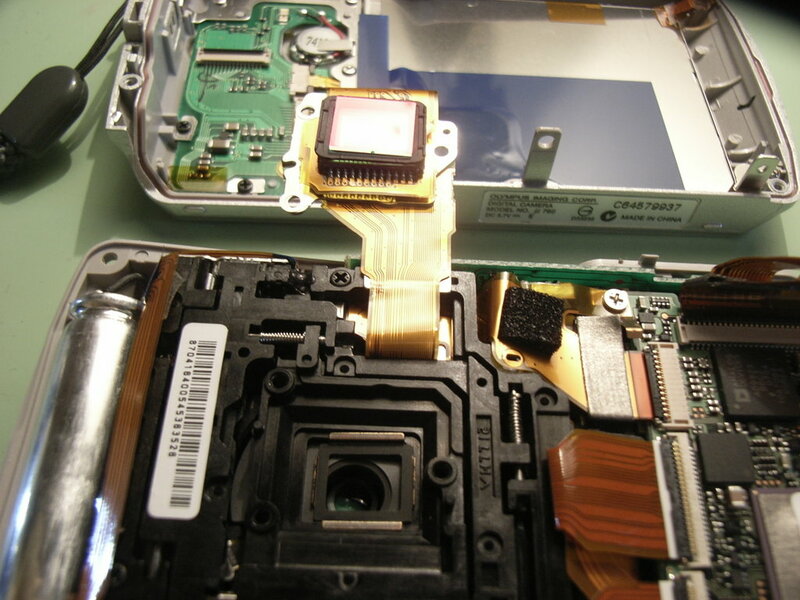 Before reseating the sensor, I cleaned its protective glass cover and the infrared filter thoroughly until not the smallest trace of dust particles or fingerprints remained. 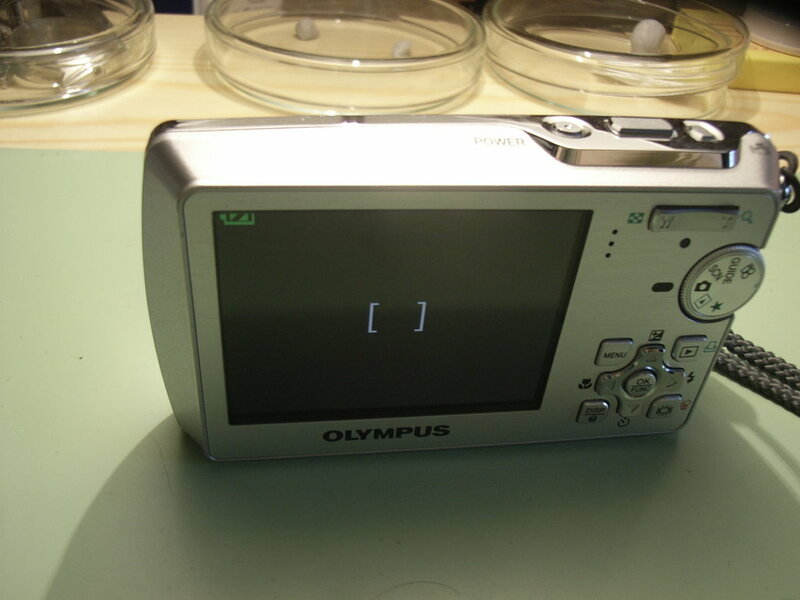 Because that close to the image recording area, both forms of contamination would affect large areas of the resulting photographs.